Who’s standing in Northumberland at the General Election? The General Election is on June 8. Here are the official lists of the candidates standing at the General Election following the close of nominations today. 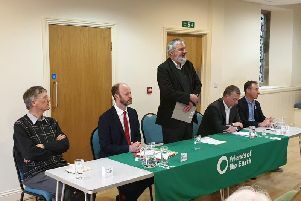 Scott Dickinson (Labour); Julie Pörksen (Liberal Democrats); Thomas Stewart (Green); Anne-Marie Treveylan (Conservative). Wesley Foot (Green); Fiona Hall (Liberal Democrats); Stuart Miles (Ukip); Guy Opperman (Conservative); Stephen Powers (Labour and Cooperative). Chris Galley (Conservative); Melanie Hurst (Ukip); Ian Lavery (Labour); Steve Leyland (Green); Joan Tebbutt (Liberal Democrats).